Tickets are now available! Dates will sell out. Book early to avoid disappointment. Dr. Fright's Halloween Nights is back! This year, we invite you to venture through the sinister locations of a derelict and cursed town! All whilst being hunted by the terrifying residents that reside there . . .
From deranged killer clowns to iconic horror movie villians. Prepare to come face to face with the most feared characters in horror! 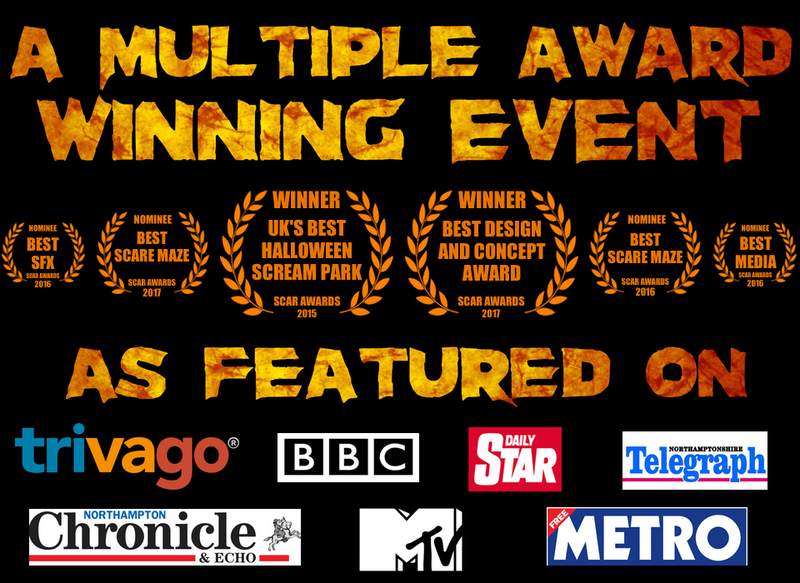 We are one of the only Halloween events in Europe to host a fresh line up of scare mazes every year! Whether it's an all new sequel to an old favourite, or a completely new maze entirely. You're guaranteed a terrifying experience that has never been seen before! All of our scare mazes, connecting areas and the Horror Bar are housed inside large marquees. So you don't need to worry about the weather! Rather be the one doing the scaring? We are offering the unique opportunity to do just that! Follow us on facebook for all the latest info, new maze announcements and ticket availability. Easy to find with a large free parking area!